Honda CBR250RR is a 'Light Weight Super Sport Bike' offered by Honda in the important 250 cc segment. It is a lightweight, highly efficient, twin cylinder sports bike. The bike is yet to get launched in India, but if it does it will totally overpower any competitor in the segment due to its high performance figures. The bike carries the impressive signature styling seen in the Honda CBR series. The bike has got an overall length of 2060 mm, overall width of 724 mm and overall height of 1098 mm. The seat height is 790 mm and the wheelbase is 1389 mm. The bike has got a 145 mm ground clearance. The fuel tank capacity of the bike is 14.5 litres with 1.9 litres oil tank capacity. Honda CBR250RR comes with a 249.7 cc twin cylinder engine which generates a power of 38.2 bhp @ 12,500 rpm and a torque of 23.3 Nm @ 11000 rpm. The bike comes with a high end 6 speed manual transmission with multi-plate wet clutch and coil spring. The CBR250RR is expected to launch at a price of INR 3,50,000. The bike has a top speed of 179 kmph. The Japanese bike maker claims that the motor is easy to handle for urban riding as well as comfortable on the circuit giving out a smooth output across the entire track. Therefore it will prove to be a very good product who love racing and also use the bike for city riding. The bike is available in 3 shades Honda Red Racing, Matt Gun Powder Black Metallic and Anchor Grey Metallic respectively. As far as the Indian markets are concerned, the bike would prove to be a tough competitor for Yamaha R3 and Ninja 300 on performance parameters. 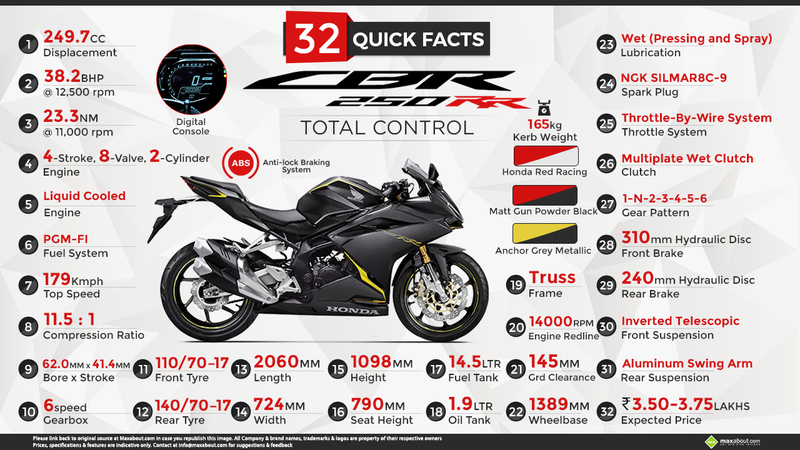 Click here to know more about Honda CBR250RR. Downloaded 114 times this week.